AWANA is a Wednesday evening program for age 3 years old (by September 1 of current school year) through 6th grade that focuses on learning the Bible in a fun atmosphere. Each week, AWANA provides consistent, positive teaching that stresses strong moral and spiritual values. Our "clubbers" learn about the reality of God and the truth of the Bible. 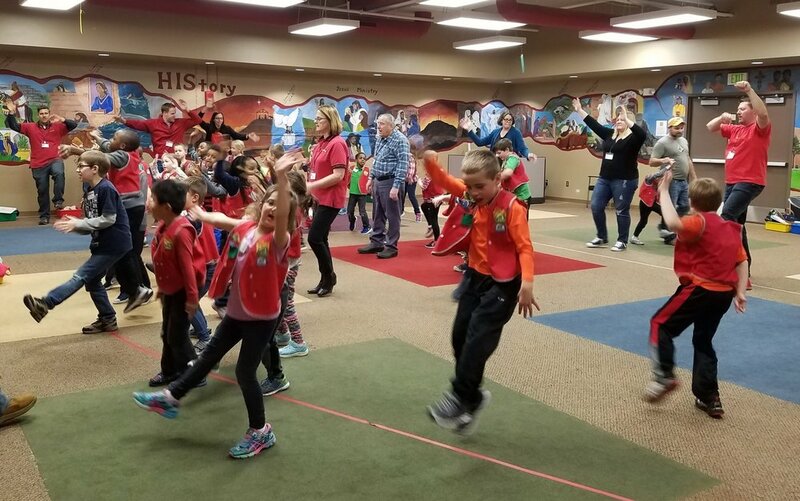 What does a typical AWANA night look like? Game Time - Every AWANA meeting kicks off in high gear with lots of team competition. Organized games get all of the children to participate, unleashing natural energy and enthusiasm. Handbook Time - Using achievement-oriented learning segments, AWANA training emphasizes the importance of God and His Word for sound living. Clubbers progress through handbooks at their own pace and leaders meet with them individually to go over what they have learned. Council Time - council time begins with group Bible study and is followed by awards and recognition for individual handbook progress and points scored in team play. When does AWANA meet and how often? AWANA meets on Wednesday nights from 6:30-8:00 pm starting September 5 and runs through April. How are the different ages divided? Is there a cost for my child to be in AWANA? There is an AWANA fee of $40 per child thru Aug. 24. The fee increases to $50 after Aug. 24. This fee covers the basic costs for your child to participate in AWANA which includes a books, prizes, achievements, etc. Are there other AWANA activities my child can participate in? Yes! Your clubber may also participate in the Grand Prix, Sparks A Rama, AWANA Games and Bible Quizzing. To learn more about AWANA, visit www.awana.org.